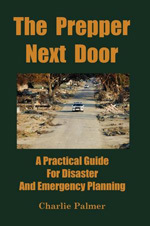 This blog is a companion to my new book, The Prepper Next Door: A Practical Guide For Disaster And Emergency Planning. I try to take a practical approach to prepping, recommending that Americans take modest steps to prepare for emergencies. The first brief chapter, “Bug Out Or Hunker Down” introduces the world of prepping. As somebody who followed the survivalist movement from the early 1980’s, I see preppers as moderate survivalists. Most preppers aren’t people who are going to move far out into the wilderness. They aren’t going to turn their lives topsy-turvy to prepare for future disasters. They do make reasonable preparations for an uncertain future. The book is written for and about the typical prepper next door. “Let Me Breath The Air” is a basic chapter about something we take for granted, breathable air. I write about forest fires, N95 masks, and carbon monoxide. For homeowners, I wanted to touch upon a few subjects of environmental health, including radon in the home. “Water: The Tonic of Life” is a longer chapter that discusses storing water, purifying water, collecting rainwater, and topics related to providing a supply of drinkable water. “Food” is a brief chapter that encourages readers to store at least a few weeks of food for potential disasters. I write about canned goods and grain, protein, fiber, and calories. “The Prepper Porta Potty Or Survivalist Sanitation” covers an unromantic topic that is of great concern to emergency rescue workers—providing sanitation after a disaster. “Let There Be A Lot Of Light” addresses basic prepper utilities. I begin with a discussion of flashlights (and flashaholics) and end with discussing generators. “Oh, My Aching Head” is a brief chapter about assembling a first aid kit and learning the basics of first aid. “Guns” is a chapter that talks about…what else…guns. It’s a rather lengthy chapter, because I begin with the very basics of learning to shoot and move into more in-depth topics that might be of interest to more advanced preppers. For example, I discuss the differences between the 308 Winchester and the 7.62 mm NATO. “Personal And Home Defense” is a two-part chapter. The main topic of the first part is hardening your home against intruders and making your home more secure. The second part talks about self-defense. “Of Fireblocking And Basements (The Prepper’s Home)” is a bit of a mishmash chapter going over topics I think prepping homeowners should know about. I write about basic plumbing repairs and gravity hot water heating systems. Here and throughout the book, I emphasize that homeowners should learn about the main systems of their home and learn how to service them. That way repairs can be made in an emergency. “Getting In Touch With Your Inner Hoarder” is a brief chapter about stocking up. Buying stuff is always fun. “Your Bug Out Bag” covers assembling a “Bug Out Bag” or a backpack of what you’d take with you if you need to flee your home in an emergency. I emphasize that your bug out bag depends on you and your plans. I wanted the chapter to be useful to both those who are just evacuating to another city after a natural disaster or those who anticipate living under primitive conditions. “Rescue Bag” is a brief chapter that discusses some of the things that professional rescue personnel use. Some of these items can be quite useful for other jobs. “Road Warrior Or Road Trip (Your Bug Out Vehicle)” talks about fleeing an emergency by vehicle. I emphasize the importance of learning the basics of automobile repair so you’ll know how to do these things if you don’t have access to professional mechanics. I also talk about some supplies you should carry in your car when you venture into remote areas. In the final chapter, “Not Everybody’s Cut Out To Raise Chickens,” I wrap up some miscellaneous topics related to prepping and survivalism.